If you’d like to do your part to help end homelessness AND enjoy a fantastic fun filled evening, come show your support for ECS at our Annual SummerTini Celebration benefiting the CHEFS program! While you enjoy an evening of signature martinis, wine, and specialty hors d’oeuvres from several of San Francisco’s acclaimed chefs and vendors, we will be hosting a live auction featuring unique travel packages and scrumptious dining experiences. Delightful raffle prizes will also be awarded throughout the evening. CHEFS (Conquering Homelessness through Employment in Food Services) is our culinary training program that finds employment in the food industry for homeless adults. This 12-month program includes classroom instruction, hands-on kitchen training, job counseling, and placement with coaching and follow-up. CHEFS students receive additional support with GED preparation, basic literacy and resume writing through the Skills Center. More than 80 percent of CHEFS graduates find work in restaurants, hotels, and nursing homes. 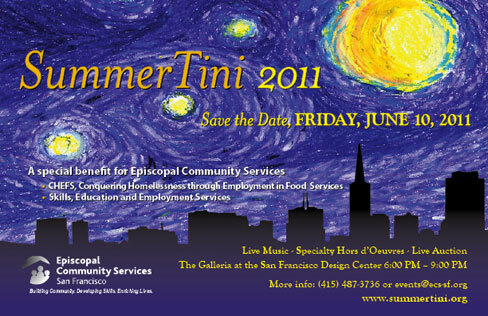 Join us for Summertini and help us ensure that our CHEFS program remains strong and continues to provide education and support to homeless adults in San Francisco. Friday, June 10th, 6:00 p.m. – 9:00 p.m.